I wondered something while watching devouring the first season of Veronica Mars this Christmas holiday. Is there some sort of statute of limitation on how long you have to leave between a TV show being ‘hot’, subsequently cancelled and you finally watching the DVDs and realising you should have been watching it years ago? There probably should be, though that might put a few people off buying the boxsets. December 2007 saw those nice people over at amazon.com make me an offer on Veronica Mars DVDs that I couldn’t refuse and seasons one and two arrived a few weeks back. I’ve spent the last week ploughing my way through twenty-odd episodes of sharp, witty and, at times, heartbreaking telly that I wish I’d watched when it first showed up in the UK on the Living channel. 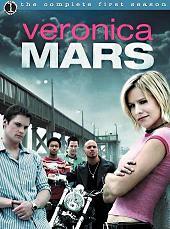 Previously on Veronica Mars…Veronica (Kristin Bell) is a High School student in Neptune, California. Her dad was once the local sheriff, until Veronica’s best friend, Lily Kane, was found murdered and Mars Snr (Enrico Colantoni) blamed her death on her parents. Nobody believed him and he was removed from office and Veronica now finds herself a social outcast in a place where she used to be one of the cool kids. Oh, and she’s also a teen private investigator. That’s the synopsis for season one, but there’s much more going on here. The Lily Kane murder mystery is weaved in and out of numerous stories that end up on Veronica’s desk each week. Missing dogs, cheating spouses and mistaken identities vie for her attention as she continues to try and work out how and why her best friend died. Although this is ostensibly a ‘teen’ show, it can be watched by anyone who enjoys intelligent television and/or crime drama. Plots twist and turn on a dime. Allegiances, painstakingly built up between viewers and characters over numerous episodes, suddenly vanish, to be replaced by mistrust and confusion. Kristin Bell is outstanding as cute-as-a-bug Veronica, while Enrico Colantoni is the perfect dad. The supporting cast are similarly good and it’s great to see the odd guest character from early episodes cropping up again to provide consistency. The show has never been short of supporters, including Kevin Smith and Buffy maestro Joss Whedon(the blonde and petite Veronica is often described as Buffy-like and a few Buffy actors pop up in the series, including Whedon himself in a cameo). I’d urge anyone who hasn’t seen the show to search it out, whether via repeats on cable or via the boxsets. It’s worth every penny and a few hours out of your life. I’m five episodes into season two now and it’s as good as ever. Rather tragically there’s only one more season after this and then it’s bye-bye Veronica, as the show was cancelled in America early in 2007.